Review posted August 13, 2016. St. Martin's Press, New York, 2015. 428 pages. 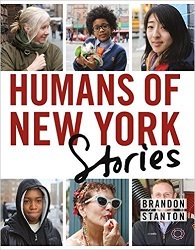 I loved Brandon Stanton’s first book, Humans of New York. Now I love his second book even more. In the first book, about half of the photographs had captions. In this book, he interviewed everyone, and includes snippets or in-depth stories from those interviews. You still have high quality photographs of random people, in all their variety, from the streets of New York. But you’ve also got their stories. Honestly, some of these stories will break your heart. Others will make you shake your head. Some are inspirational. Some are simply cute. There were several with the caption “Today in microfashion,” showing a small child dressed in a striking outfit. What comes home to me after reading it is the sheer number of amazingly unique people on our planet (let alone in New York!). Many of the stories go on for paragraphs. This isn’t as quick a read as the first book. However, I’ll quote a small selection of some tantalizingly short captions to give you an idea. Imagine wonderful photos of the people doing the talking. Reading this book is a wonderful way to celebrate the amazing diversity of humans.